1. I need Finn to be a badass of his own. We’re on the come-up now, Black people. We’ve got a Black male lead set to take on an iconic science fiction role: A Force User, perhaps dare we dream, a JEDI. He even already has a Lego fig! But what I need from this role is something different. I need Finn to be a badass unlike the other Black men in Star Wars have been — not like Lando Calrissian, the smooth talker, or Mace Windu, the chill father figure. I don’t want him to step into Luke Skywalker’s shoes as the naive farm boy who saves the galaxy or to become the new Han Solo. I need Finn to be some other kind of hero. The set-up is there for the formerly heartless Stormtrooper to discover his humanity. If the movie sticks with that and hits that spot between familiar archetype and surprising new interpretation, they’ll have done something really novel and gone beyond diversity of casting and into real diversity of characters. 2. I need Princess Leia to outgrow “princess”. It has been more than 35 years since we first met Princess Leia as the spunky face of the Rebellion. She floated between leader and figurehead, trophy to be saved and damn good with a blaster in her own right. That was a long time ago. There’s some indication that in this movie she’ll take on the title General Leia, though the press continues to tag her a “princess” in most cases. Only the final reveal will tell. But if a woman who’s fought the good fight for a generation can’t get her own command, if the Glass Ceiling exists even in a galaxy far, far away, then…well maybe the Star Wars universe isn’t that different from our own. And that makes me sad. 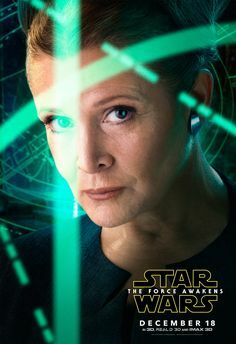 Besides, Carrie Fisher has been bringing so SO much “no fucks” attitude to the press tour leading up to the movie, she might deserve to be called a Hollywood queen all on her own. You’ve seen the Good Morning America interview with her and her dog, Gary, right? 3. I need them to get the CG right. In this wish list, I’m trying to stay away from bashing Episodes I-III of the series, because really, it has all been said before. However, this is one place where I can’t help myself. Computer Graphics in a movie can do a lot of things, but it shouldn’t be wasted on endless vistas that add nothing to the story, or on cartoonish side characters. I like CG best when it adds a dash of hyper-reality to an already amazing setting. It should make a movie look almost too real, but only almost. When CG instead makes me feel like I’m in a My Little Pony cartoon, someone let the techs and designers go too far. You remember the romantic field romp in Episode II: Clone Wars? He rides an imaginary buffalo across an impossible landscape! Do you know how much this scene would have cost to produce? For what? Why? Why!!!!?!!! 4. I don’t need comic relief. You knew it was coming — the Jar Jar Binks stuff. And I’ve got all the usual issues with Jar Jar. But what I really don’t like about him is how unnecessary he is. I don’t need Star Wars to be funny. I need it to be interesting and exciting and awe-inspiring. Not funny. Now, at points it is funny, just by the nature of people (and aliens) being as they are. C3-P0 and R2-D2 have a funny Odd Couple thing going, sure. But much of the humor comes up spontaneously. Luke whining, Han and Chewie being dudes together, Lando Calrissian being Lando Calrissian. These characters going about their daily lives in the midst of extraordinary situations brings enough humor to get me through the tense scenes. Trust me. If I wanted slapstick comedy (excuse me, a racist slapstick comedy) I’d watch any other movie than this one. Literally Any Other Movie. Now, beyond what I need, there’s plenty I want from this movie. I want the space fights to be crazy fast and flashy. I want the aliens to be weird. I want it to be kid-friendly so I can share the wonder I had as a child with my own kid. Most of all, I want to be amazed. Amazed not by the flash and bang of it, but by the simplicity of it. That’s what’s amazing about the original movies, all 6 of them. The plots are simple, I could repeat the whole story to you without having to draw any diagrams before you finished a cup of coffee. What amazes is the emotion wrapped around these basic plots. There’s a sense, even at the weakest moments of the movies, that they are imbued with so much…I’m not even sure what…so much hope perhaps? So much something that they have a life and power of their own. I’m ready to be transported to that other galaxy again, to imagine I’m there for a while, just in the time of year when I can most use a break. I’m on the hype train y’all, so I gotta go. This set of action figures (did I mention that Finn has an action figure?) and Millennium Falcon Lego playset ain’t gonna wrap themselves.